I love the heirloom baby girl quilt! It's absolutely beautiful. I follow Nathalie on Pinterest! I would get the Boy Lovey Blanket with Custom Hand Embroidery! So cute!! Oh my, how lovely! I am partial to the "Dream" Eye Pillow and a custom Tooth Fairy Pillow. Sweet. I also followed her on Pinterest and liked her on Facebook. i would get a baby boy lovey for my BFF's baby boy! I love the baby loveys! My friend is having a girl later this year! I would pick the boy XL custom lovey for our second son - http://www.etsy.com/listing/103354369/boy-lovey-xl-with-custom-hand? and follow on pinterest too! Love their owl taggie lovie blanket!! I love the girl lovey blanket! So pretty! I love the baby boy lovey blanket! I would get a baby girl lovey for my daughter who is due in 5 weeks! I would get a baby girl lovey for my daughter who is due in 5 weeks!! I'd get the baby boy lovey!! I have ordered at least three different times from Nathalie. Her work is amazing :) I could put the gift card to good use!! I would purchase the baby boy lovey!! I have purchased from Nathalie at least three times, her work is amazing! That lavender sachet is so sweet! I might get a baby boy personalized lovey with hand embroidery. So cute! The little loveys are adorable! I'd get a baby girl lovey for my soon-coming niece! Thanks! I love the pillows and the lavender sachets! Nathalie's eye pillows are beautiful, as well as her tag lovies! 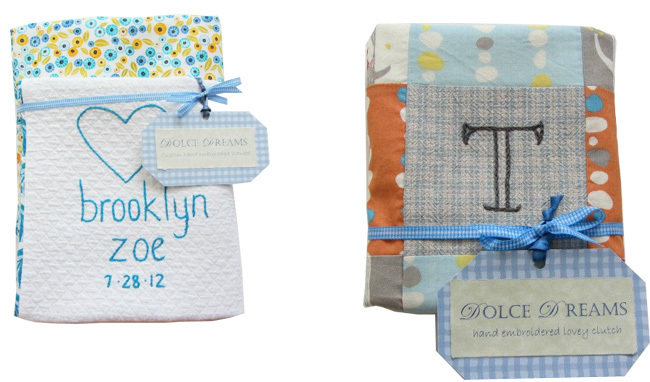 love the custom baby blankets! Liked Dolce Dreams on Facebook! Love everything Nathhalie. I love the lavender sachets! !